The quality of your facial cleanser is important: not only because you use it twice daily, but also because it has to clean effectively to prep the skin properly for moisturising. The Clarins One Step Facial Cleanser - rich in plant extracts - removes make-up, impurities and pollutant aggressors in one fell swoop. Detoxify, revitalise and freshen skin with this double-phased wonder to leave it feeling supple, soft and toned, ready to reap all of the nourishing benefits of your moisturiser. Shake before use to mix the formula. Apply cleanser to a cotton pad and swipe it gently around the face. Repeat until the cotton pad comes away clean. 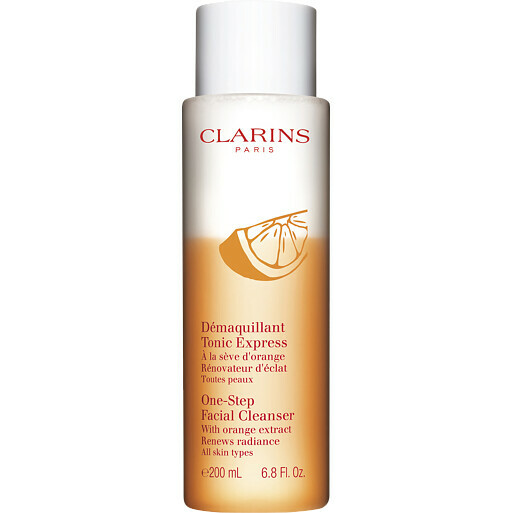 Clarins One-Step Facial Cleanser 200ml is rated 4.9 out of 5 by 32. Rated 5 out of 5 by kateinmanchester from Really nice to use This is the first time I've tried this product and I'm really happy with it. I have dry skin and it does an effective job of removing the day's grime without drying my skin. As a bonus, it smells lovely! Rated 5 out of 5 by Z1317 from Lovely fragrance & cleanses well Great cleanser that removes make up as well as everyday dirt easily. It has a lovely fresh fragrance and leaves skin feeling clean and fresh. After use my skin feels soft not dry or oily. Rated 5 out of 5 by Jules60 from Excellent product This is an effective and convenient cleanser that takes off all my make up. My skin feels nice and soft afterwards. It may seem expensive, but the bottle is huge and it lasts for absoulutely ages.